I was recently at the annual conference of the European Utopian Studies Society held at New Lanark, the model industrial village set up and run by Robert Owen on the banks of the Clyde. Utopian Studies is a very mixed academic bag with conference papers ranging from one entitled ‘On the Possibility of a Constructive Dialogue Between Marxism and Anarchism: The Case of Ursula K. Le Guin.’ by Tony Burns, from the University of Nottingham, through to more prosaic ‘Change and longevity in intentional communities’ by Professor Tim Miller from Kansas University. Sadly, the opening talk of the conference due to have been given by Scottish author Iain Banks about his science fiction novels about the interstellar anarchist utopian society known as The Culture had to be cancelled due to his untimely death from cancer. Much of the conference proceedings were, perhaps naturally given the location, taken up with discussions around the legacy of Robert Owen with papers exploring the wide influence of his ideas and trying to unpick some of the more obscure moments from his long life. The model village at New Lanark, now a world heritage site, pretty much steals all the Owenite glory these days with the other communities started by Owen and his followers obscured by its shadow. Largely it has to be said due to the lack of anything tangible on the ground left from the other communities to act as any sort of focus of attention. While researching the Owenite legacy for my book on early British utopian experiments, Utopia Britannica, I tried to track down and visit the locations of all the known Owenite communities in the UK. This variously involved trips to the Cambridge fens in search of the Manea Fen Colony, a stroll round a Scottish housing estate which has street names such as Babylon Road. 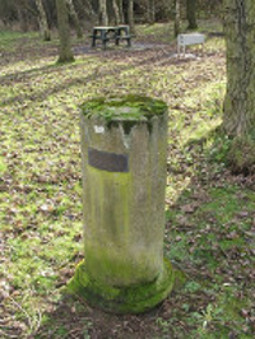 and Community Road the only signs, along with a plaque in the local park, that the Orbiston Community ever existed. 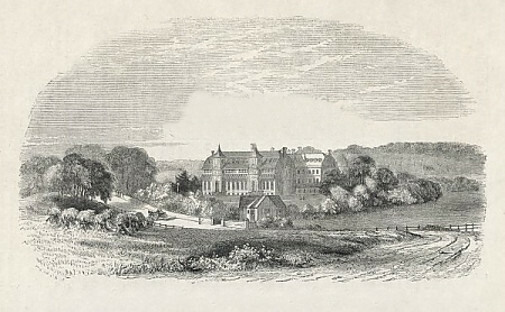 I took a trip to Blackwood in the Welsh valleys looking for any evidence of “…an experiment for improving the condition of the labouring classes of society, in the hills of Monmouthshire.” started by local magistrate and industrialist John Moggridge who had been inspired by Owen’s ideas – I didn’t find any. Scoured the local history section of Irlam Library for any mention of the Chat Moss community . And finally with my Diggers & Dreamers editorial colleague, Jonathan How, I spent an afternoon looking for the remains of Harmony Hall at East Tythersley in rural Hampshire. The description we had of the site mentioned that there were a few remains of the building foundations and, sounding somewhat Narnia like, two lampposts in a wood. Alas the lampposts had gone and though we searched in the undergrowth for any sign of the buildings foundations we never found any. 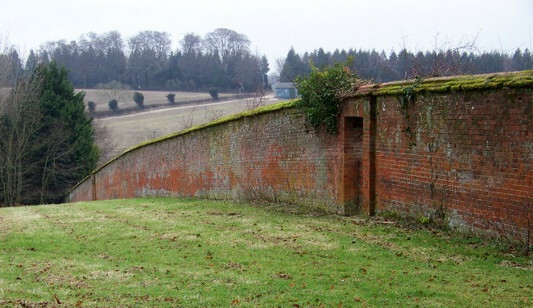 A bit further up the road was Queenwood farm and cottages and a section of wall from an old and obviously once very extensive walled garden. We weren’t sure at the time but these turned out to be part of the Owenite community estate. Walled Garden at Queenwood Farm. © Trish Steel may be reused subject to this creative commons usage licence. Following the success of New Lanark Robert Owen had spent the early years of the 19th Century trying to persuade the great and good to back his schemes for reordering society along co-operative lines. When the great and good refused to respond Owen turned to the working classes and instigated a grassroots Owenite movement with branches across the country. It was this movement with its network of halls of science and social missionaries that was the driving force behind the attempt to set up Harmony Hall. The first colonists arrived in the early winter of 1839, sponsored by their local Owenite branches, mainly from northern industrial towns. By the following February they were busy digging, gardening, manuring and ploughing, excavating clay for bricks, and attending evening classes in dancing, drawing, grammar, geography, elocution, agriculture and music. In contrast to the extravagance of the building works, the colonists themselves survived on little more than subsistence rations. Visitors to Harmony Hall were impressed by the effectiveness of the organisation and the advanced techniques that were employed in the gardens and fields. The gardener was busy directing operations on a twenty-seven acre market garden, shepherds were with the sheep, nine ploughs were at work, and over a hundred acres were sown with wheat. 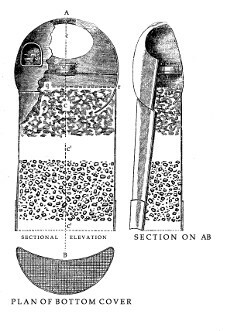 Compared to local farms the socialists were able to get good yields from the shallow, flinty soil – one of the reasons for this was the systematic manuring they practiced – they had constructed a reservoir to store liquid manure and in the woodlands vegetable matter was mixed with lime and piled into compost heaps for use on the fields. It was as much the success of socialist farming that posed a threat to the local establishment as socialist theories and propaganda. In contrast to all this practical organisation and efficiency the management of the community was fraught with problems from the start – Owen had resigned as Governor before the project was even started. The managers appointed were often at odds with the central committee of the Owenite Rational Society, which felt that it should have a say in the day-to-day running of the place. Numbers started to dwindle and by the summer of 1840 they were down to 19 and having to hire local labourers to bring in the harvest. Somehow the remaining members carried on but with little support from the branches and by the end of the following year they were in dire financial straits. At this point Owen reappeared with a group of middle-class investors, who were prepared to ‘rescue’ the community as long as they had the governing control, which in effect meant dictatorship by Owen – Owen then embarked on a spending spree, extending the farms and setting up a fee paying school with fees so high that no working class Owenite could possibly afford them.This was done at the expense of other projects; by sacking the Social Missionaries and cancelling grants to the halls of science. When the promised money from his friends failed to materialise he instigated austerity measures sacking all the hired labour, increasing the residents workload and putting them all on a bread and water diet . Demoralised and disillusioned the rank and file members with the support of socialists in the branches finally revolted and removed Owen as governor at the 1844 annual congress. There followed a series attempts to turn it into a democratic working-class controlled community by a succession of managers, but the financial burden was too great. It was left to William Pare to try and sort out the mess. The community officially coming to an end in mid-1845 amid acrimonious scenes. Harmony Hall was advertised for sale in The Times as suitable for use as a lunatic asylum. 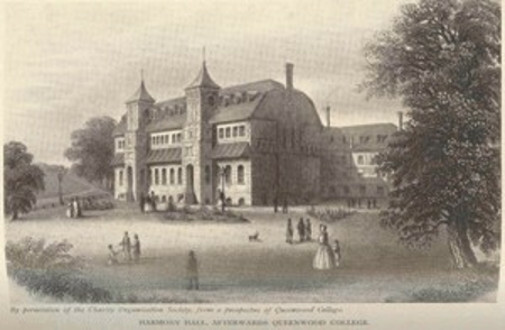 The Hall was eventually leased by the Lancaster Quaker George Edmunson who set up an early progressive school called Queenwood college. Among the staff at Queenwood were two teachers who had been at the Swiss educator Philipp von Fellenberg‘s school at Howfyl in Swizterland. Other staff would go on to have distinguished scientific careers, perhaps the best remembered now being John Tyndall who laid the foundations for the understanding of the modern science of climate change.Tyndall was a largely self-taught scientist. Born in into a Protestant family in Leighlinbridge, Co. Carlow,Ireland, he started his working life with the Irish Ordnance Survey as a surveyor/draughtsman in 1839 and moving on to the English Survey in 1842. From which he was sacked in the following year partly because he protested at the Survey’s treatment of the Irish. He then worked for three years surveying on the British railways before coming to teach natural science(physics) and mathematics at Queenwood College. Though he only spent two years teaching at the college, during that time he also acted as the school’s secretary and later donated his books and Lab equipment to the school. It is for the work carried out in various scientific feilds after he left Queenwood that he is remembered. 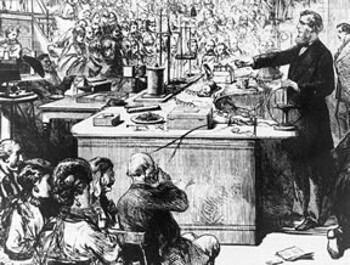 In a paper published in 1861, entitled On the Absorption and Radiation of Heat by Gases and Vapours, and on the Physical Connexion of Radiation, Absorption and Conduction, he outlined the basis of the greenhouse effect. The paper was the text of a Royal Society Bakerian lecture given by Tyndall, who was a gifted public lecturer and great advocate of the public understanding of science. He was also a noted mountaineer and made many trips to the alps to climb and study glaciers, making the first ascent of the Weisshorn and would have been first to climb the Matterhorn, but his guides refused to attempt the final peak. He has both a mountain, Mount Tyndall in the Sierra Nevada in California and three glaciers (one in Chile, one in the Rocky Mountain National Park Colorado and one at Ice Bay in Alaska.) named after him. Among the list of his other eclectic scientific achievements are the invention of the fireman’s respirator and the invention of a ‘light pipe’ that led to the development of fibre optics. To a great extent Tyndall is one of the lost and forgotten greats of 19th Century science who should arguably be remembered alongside the likes Darwin and Huxley. In scientific circles, he is recognised with both Ireland’s Tyndall National Institute and the UK’s Tyndall Centre for Climate Change Research bearing his name. He is most regularly remembered in the popular imagination for his ‘Blue Sky thinking’, as the man who explained why the sky is blue through his discovery of what is known as the Tyndall Effect whereby the Sun’s rays are scattered by molecules in the atmosphere making it appear blue to the human eye. In September 2011Professor Richard Somerville, of Scripps Institution of Oceanography at the University of California, San Diego gave a Public lecture celebrating the life of John Tyndall as the opening address at the Tyndall Conference at The Mansion House, Dublin. Note: Queenwood College ceased to function as a college in 1896 and became a centre for teaching poultry farming and electrical engineering, The entire building was destroyed by fire on 10 June 1902 and was demolished in 1904. This entry was posted in 19th Century communities and tagged Harmony Hall, New Lanark, Robert Owen by chris-coates. Bookmark the permalink.